With the national debate having surpassed the $20 trillion mark, Yellen is certainly correct. National security experts have repeatedly warned the national debt is the single greatest national security threat to our country. She also discussed the issue of expenditures on Social Security, Medicaid, and Medicare growing faster than tax revenues as the population of the U.S. continues to age. Yellen said the U.S economy was strong beyond the ballooning national debt, with the country near full employment and the financial system steadied by Dodd-Frank. 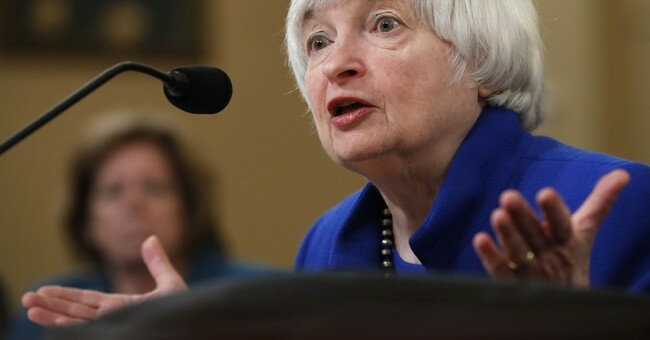 She said that the Fed would likely raise interest rates soon to bring monetary policy back toward historic levels. Some of the Fed's liberal members have expressed concerns about raising rates with inflation still lagging below the Fed's 2 percent target. Fed leaders, including Jerome Powell, Trump's nominee for Fed chair, say they're not sure why prices have increased a lower rate than ideal. Yellen has said she will retire when President Trump’s nominee, Jerome Powell, is confirmed.